Rich chocolate ice cream combines with malt powder to create the perfect milkshake. Chocolate Malt Milkshakes are something that will forever remind me of my dad. I have fond memories of chasing down the Mr. Softee truck with a fistful of quarters for two Screwballs (I totally need to find these for at-home consumption) and a Chocolate Malt with extra malt. Back then, malts weren’t really my thing. However, I desperately wanted to love them just because Dad did. I’d sneak sips of his when he wasn’t looking in an effort to acquire a taste for that nutty, malty flavor. Eventually I started to love them – although my preference was, and still is, a vanilla malt heavy on the extra malt. Since my dad is all about malt, I’m sure it comes as no surprise that he’s mildly obsessed with Whoppers Robin Eggs. And my typical hoarding ways compelled me to buy one too many bags this Easter season. When I was telling Eric all about the Mister Softee chasing days of my youth, he divulged that he’s never – in his whole life – had a malt. What?! Of course I immediately had to fix the situation. Armed with my Blendtec, chocolate ice cream, and a jar of malt powder, I set out to make Eric a chocolate malt lover. 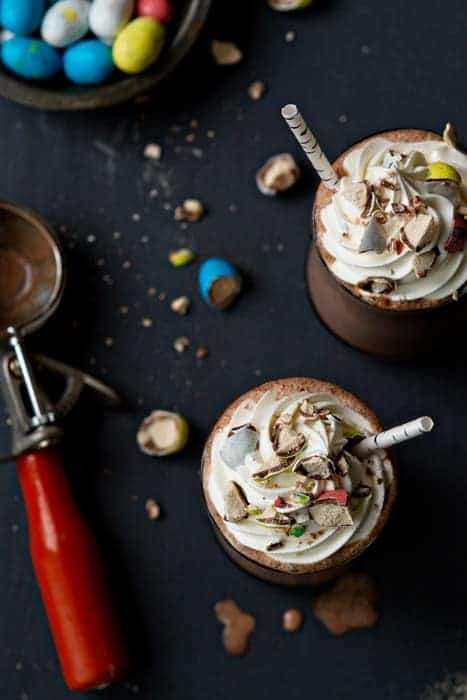 I poured the thick, rich shake into a glass and finished it with a swirl of whipped cream and crushed Whoppers Robin Eggs – ya know, just because I’m over the top like that. And… he hated it. His face was reminiscent of a toddler experiencing a pickle for the first time. I tried to bribe him into taking another sip; however, he dry heaved, so I gave up and drank it myself. Clearly malt is an acquired taste, for sophisticated palates like my dad’s and mine. I’ve decided to take the glass (malt shake glass, that is) half full perspective. So what if Eric doesn’t care for chocolate malt shakes? More for me! And don’t you worry – I’ll raise Elle right. She’ll learn to love chocolate and vanilla malt shakes like her mama and grandpa. Place ice cream, milk and malt powder into and blender and blend on medium-high speed until thoroughly combined. If desired, top with whipped cream and chopped Whoppers. Serve immediately. Ha ha! I can totally picture the expression on his face! I love malted milkshakes, but I definitely think it’s one of those “love it or hate it” flavors. A very divisive substance, malt. I absolutely adore malt. My last blog post was malt related lol. THIS is my all time favorite flavor of shake and yours looks delicious! Where can I buy malt powder? I picked up the Carnation brand at Target near the sundae toppings, you can also find it on Amazon. Thanks for stopping by! This is really bad – but when my girlfriends and I would walk home from high school our sophomore year, we would stop at this grocery store dinette and we would order the best chocolate malts that were made in those big metal mixing cups!! Oh those were SO good! But we would also share some French fries…and nothing goes better with a chocolate malt, than hot, salty fries! Oh to be young and able to eat food like that again and not gain a pound!! I want one of these so bad! 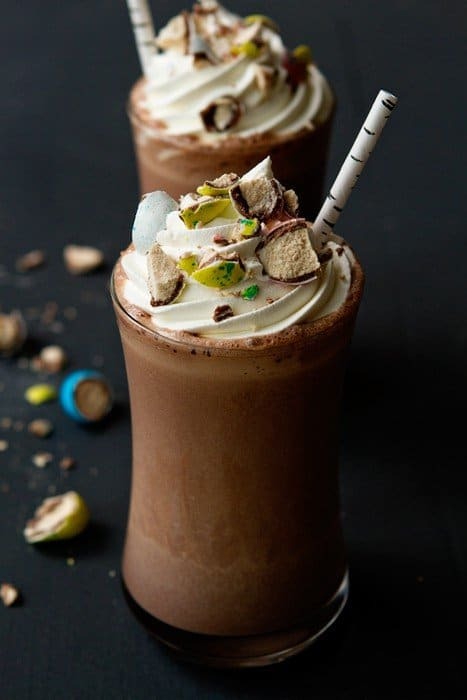 This looks like the best milkshake ever! What a nut. I love malt — LOOOVE. I’ll take his portion any day!! That made me laugh. I can just picture his face. I have a hard time finding malt where I live, but I do love it. I still make the old fashioned malts at my store. I use about the same stuff only instead of using chocolate ice cream I use a pump and half of HERSHEY SYRUP and VANILLA ice cream. I use the old metal cups and an antique Hamilton Beach spinner. YUMMY is the word! Ha! I hear ya! That’s how it is with smoothies around here! Thanks for stopping by! I’m so glad you and your husband enjoyed them, Karen!